I thought some of you might enjoy these pictures of a Christmas present that I received a bit early this year. The story here is that my Dad delights in working with his hands and his tools. 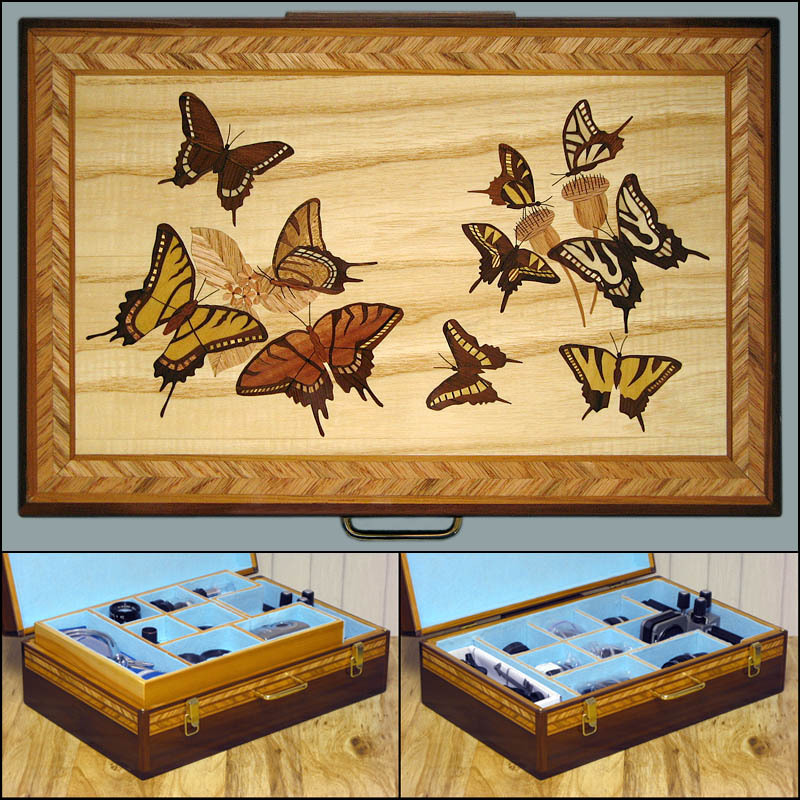 His latest hobby is marquetry, an artistic form of woodworking in which wood veneer is cut and pieced together to make pictures and patterns. 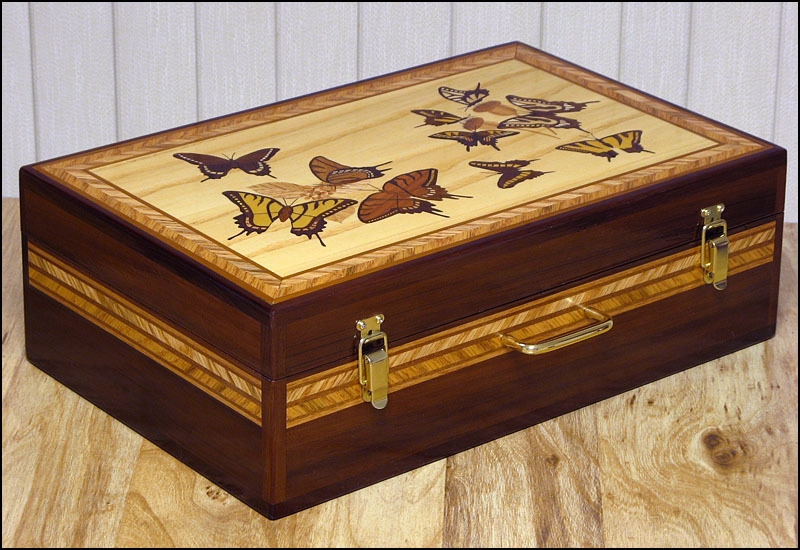 A few months ago, I was admiring some of the cabinet fronts and boxes that he had made for my Mom, and I asked if perchance he might enjoy making one for me too. (OK, actually I did the old begging-puppy imitation.) Sure, he said, but what did I want it to fit and what sort of picture did I want on the lid? Well, as it happens, I'd been thinking that my collection of Olympus bellows macro lenses needed a nice place to live, and for that matter why just the lenses? 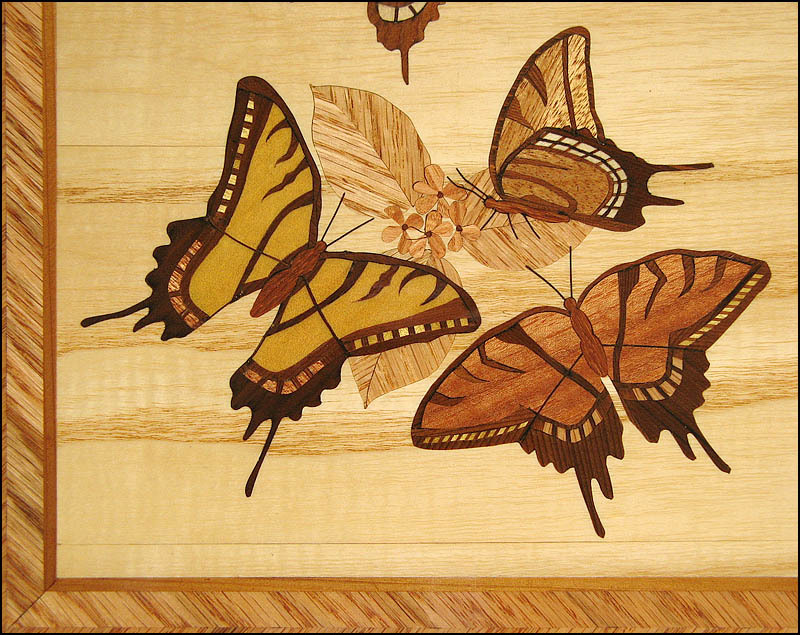 And for the lid, what better than my beloved butterflies, which had provided not only many hours of entertainment, but also funded a good chunk of college, more years ago than I'd like to admit. So here we have it -- the genuine one-of-a-kind Olympus bellows macro collection Gift Box. I hope you enjoy these pictures as much as I do the box. Design and craftmanship by Kenneth Littlefield. Thanks, Dad! Now that is really nice! I could think of many uses for something like that. As you have it for camera lenses, microscope objective collections came immediately to mind, or polished rock and gem collections. That is something that can be handed down through generations. It must have taken some time to make with all the intricate wood work. Indeed it is something cherish through the years Rik. All I can say is "WOW!! DON"T YOU WANT TO SWAP DAD'S??" This is really wonderful workmanship Rik, and as Ken says, something which you can be proud of and can be handed to the next generation. There is nothing better than present which is hand-made and made with love too. This is beautiful. You dad is very talented and this is something to cherish and pass down for generations. Yes, this is a beautiful piece of work. I am very pleased to be able to share it with you. that is just awesome, some real fine skills right there. What a skillfully made piece of craftsmanship! Well, they say 'like father, like son'. And yes, both the Littlefields seem to do the things they do with great dedication and devotion what, together with talent, leads to great successful results in the end. And besides, it´s always nice to hear of harmonious family life, especially at this time of the year.